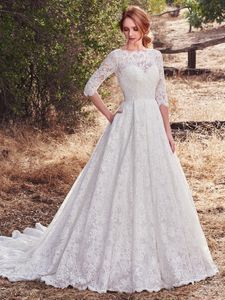 Description: This vintage-inspired wedding dress features allover lace with sheer lace comprising the three-quarter sleeves, bateau neckline, and square back. Softly scalloped trim completes the unique glamour of this ballgown. Complete with pockets at the hip and finished with covered buttons over zipper closure.